As has been well known not only across the state of California, but nationwide, the Los Angeles teachers union recently underwent a strike for many reasons, causing a major disruption in the large and very populated district. The strike went on for nine days after at first being delayed by courts, who hoped to reach an agreement before having a strike at all. The teachers went on strike for not just themselves, but their students, ultimately for the sake of addressing the many issues within the school district and demanding change. 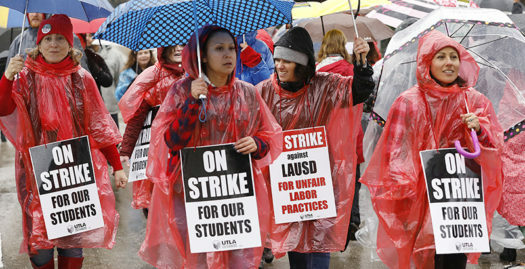 The primary purpose of the strike was to establish better conditions for L.A. schools, with the main complaints addressing the large class sizes that made it not only difficult to teach but also to learn, higher pay for the teachers and staff, and the need for more counselors, nurses, and librarians, which many schools were severely lacking. In the end, the teachers union were able to come to a compromise with the district. After risking their health to strike during Los Angeles’ rare rainy season, the results were promising: smaller class sizes, higher pay and retirement benefits, and more staff to compensate for lack of bodies in specific departments in schools. Although the strike was a success in many ways, there were a number of concerns. Most of these concerns focused on how much the children would suffer. Many were worried that the children would fall behind and the strike would result in a significant amount of money loss. However, many schools were still open and there were even resource centers available to provide care for children, including food and activities, in the absence of school workers. At the end of the day, the strike only promises a better learning environment for students, proving to be beneficial in many aspects of teaching and overall functions of L.A. schools. This is only the beginning, however. Thanks to the publicity of the strike, as well as the passion and dedication put in by not only teachers, but parents, students, and other citizens, the sparks first made by Los Angeles have ignited into a teachers’ revolution. In fact, teachers from three charter schools in L.A. have continued to strike against a charter school operator, making history in California as the first time a charter school has gone on strike. L.A. teachers have also had an influence statewide, leading Oakland to take a vote on the issue of whether they will strike. Even Denver has authorized a strike, showing the L.A. strike’s national impact as well. No matter the position, Los Angeles teachers have certainly proven to be a game changer when it comes to having a voice in such a strict system, inspiring many to do the same.